Pointsettia Lazy Susan Mat -- $1.99 A Crochet pattern from Julie A Bolduc. This Lazy Susan mat is fast and easy to make and would look good on any Christmas table! 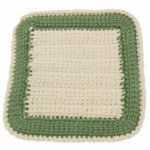 It can be made with other colors and the last 2 rounds omitted for use in an afghan if you like. Because it is an octagon, you would need to include small filler squares to make an afghan.